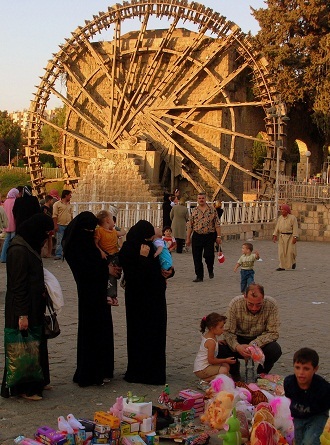 A late afternoon weekend market in Hama, Syria, back in 2006. In the background is the city famed Noria (ancient water-wheel). These past days, I have been following the news from Syria in disbelief. What surprises me the most is not the Syrian government’s defiance against international pressure, sending in tanks and shells to quell rebellions in Hama and other cities; the unexpected are images of Syrians taking to the street openly. “We don’t talk about politics,” this line parroted by nearly all Syrians I met during my travel there in late 2006 still ring in my ears, and the violently muted reactions of Syrians whenever I broached into domestic politics filled pages of my diary. Back then, I had arrived in Syria shortly after the 34-day war in neighboring Lebanon, the fighting ground for Israeli and Hezbollah military forces. The Syrians displayed their solidarity with Hezbollah, Lebanese, and Palestinian victims in the conflict by putting up “anti-war posters” in the streets; laymen became learned commentators of the conflict, everyone had a piece to say about the US-Israel conspiracy against the Arab and Muslim world, and anti-Zionist views abound. A Chinese supermarket put up a notice to inform customers it has run out of supply for salt. Rumors have caused panic buying salt across China. “Have you bought any salt yet?” this has become a common greeting line in China over the past few days. 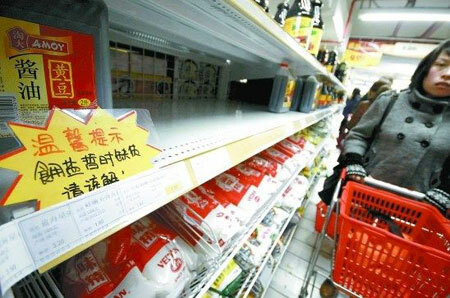 As Japanese are making long queues at supermarkets that impose ration on purchases of daily goods due to shortage in post-quake Japan, China has sunken into a ridiculous panic buying over salt, resulting in supermarkets in some major Chinese cities to run out of supply. Few days after a 9-magnitude earthquake rocked Japan, triggered tsunami, and later a nuclear crisis, rumors have been circulated across China via internet forums, micro blogs, mobile text messages, and words of mouth that intake of salt, which contains iodine, could prevent sickness from nuclear radiation exposure.